The train I get always starts from Swindon and usually goes as far as Westbury, so I am surprised to see that it is going all the way to Southampton. I am also surprised to see that it is just a single "bubble car" train, which I suppose is normal for a train that only runs twice a day at awkward times. Chippenham station is a fine example of a former Great Western railway station decked out in yellow Cotswold stone, and as yet hasn't been spoilt by ticket barriers. One thing that the powers that be have done to spoil its ambience is to take the track away from the original Bristol bound platform, so in effect one of its three platforms is redundant. Instead passengers travelling west have to cross over the footbridge to get to an island platform where trains stop - Platform 1 for westbound trains and platform 2 for eastern bound trains. We are told that the train is running approximately ten minutes late. We are not told why, but the previous westbound train was also ten minutes late, so I guess it is because of the delay I faced earlier when I came from Paddington to Chippenham and was held up by signalling problems in the Slough area. My guess is that this has had a knock on effect to all the trains and so my 19.01 train has had to wait for a path to be free. Quite a few passengers get on for such an awkwardly timed train - ten in fact, whilst just one gets off. Surprisingly the train is over half full. So obviously word has got round about this important cross country train between Swindon and Southampton. Still the carriage seats are in good order much better than the dreadful Sprinter carriages. We finally leave at 19.14 after a brief stop to let everyone on and then we crawl along the mainline, travelling along an embankment with views of Chippenham below us on the left. We go for a couple of miles at only 30 mph, before we finally leave the Great Western mainline and turn south at Thingley Junction. We move onto single track and the train then speeds up to at least 50 if not 60 mph, the driver obviously trying to make up lost time. We seem to be going downhill, and the journey seems quite smooth on the single track. We go along an embankment and there's not much to see apart from green fields and a hill in the distance on the left. We pass an electricity sub-station on the right and then start to slow as we come into the town of Melksham. We pass some factory units on the left and then some houses before we stop at Melksham station, which is a single platform with a blue framed shelter. Eight people get off, whilst three get on, showing that there is a need for a more frequent service on this line. As we leave, we pass more factory units on either side of the track, indicating that the station seems to be on the outskirts of the town. We are soon back out into the countryside again with fields of sweet corn on either side of the line. These go on for several miles as we reach 60 mph again. The landscape is pretty flat round here, though the fields start to have cows in them. We pass a large factory on the right with the name CPUK on its side and then houses appear as we come to the outskirts of Trowbridge. We pass lots of new houses on the left and then enter a cutting. We almost stop as we wait for the signal to change to green to let us onto the Wessex mainline. 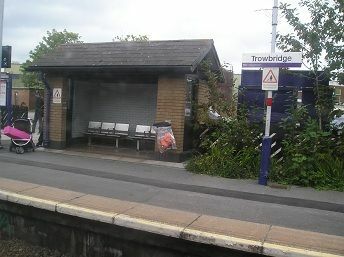 We then come in to Trowbridge station which has been modernised in recent years. It has a small yellow brick shelter on the left side and a large yellow brick station building on the right side. The train arrives at 19.34 after a twenty minute journey from Chippenham, still over ten minutes late, but by the time we get to Westbury the train is only a couple of minutes late.